accommodate up to 12 guests. It has indoor areas include spacious saloons, lounges and decks: the main salon features a retractable sunroof to take in the beautiful Australian weather. 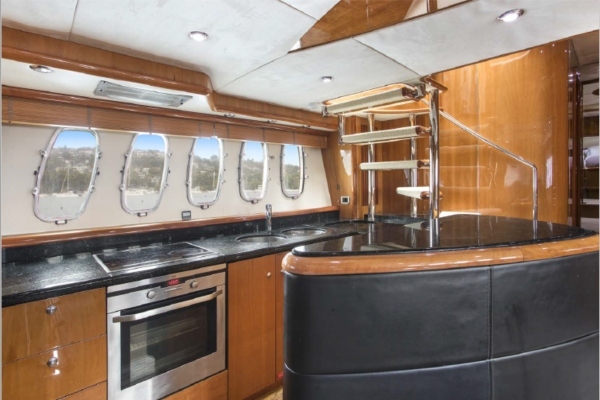 A fully equipped galley with oak looring, granite bench tops. Drawing you outside, are massive sunbeds in the bow and a bathing platform, which turns every sea into your own private pool. 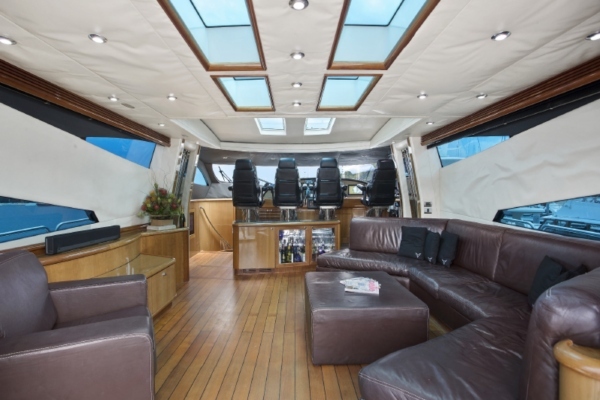 The aft or main deck includes retractable sun awnings, a BBQ and wet bar, as well as seating for up to ten people. The swimming platform includes a hot shower, so the refreshment lasts longer than your swim, snorkel or paddle. 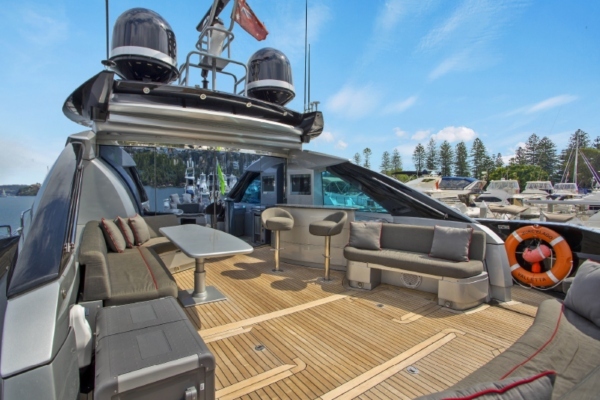 MURCIELAGO is equipped both inside and out with an incredible array of personal and big screen entertainment. This includes the brilliant Sonos surround sound system, which enables you to control your music from your phone. All hourly, day and single night charters are inclusive of vessel hire, marine crew, fuel, wharf fees & GST. 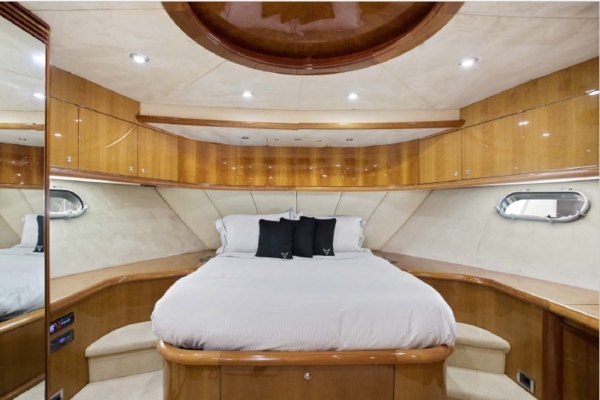 All multi-night and weekly charters are confirmed by a MYBA Charter Agreement for a maximum of 6 guests overnight. 10% GST and APA (Advance Provisioning Allowance) of 30% of the charter fee apply for all multi-night and weekly charters. The yacht is supplied with 4 full time crew including a personal chef. 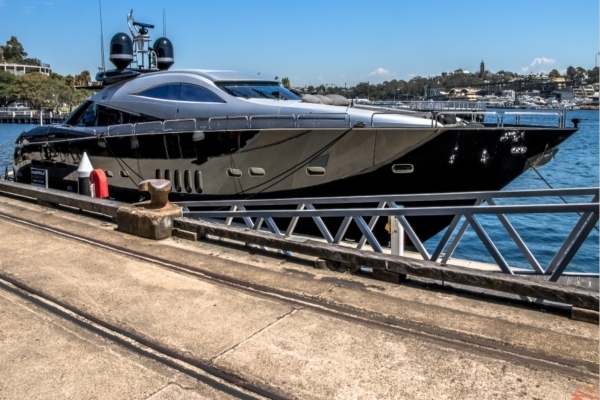 A surcharge of 25% applies to vessel hire on public holidays. A minimum charter period of 8 hours applies to Christmas Day charters. A surcharge of 50% on vessel hire and minimum charter period of 6 hours applies to Boxing Day charters. For further details, please contact us at Ph 1300 311 200. All staff costs and service charges are inclusive of GST. A surcharge of 100% applies to wait staff on public holidays. MURCIELAGO is a BYO alcohol vessel – the beverage service charge includes beverage service, glassware, still/sparkling water, soft drinks/mixers, juices and ice. A minimum spend of $1,350 applies to all catered jobs. charges andthe minimum spend will be charged. are required, the chef will be charged at $77 per hour. between the total platter price and the minimum spend will be charged. A delivery fee of $60.50 applies for all platters which are not incorporated in a canape or buffet menu. A chef charge of $660 applies on public holidays for all catered jobs of up to 4 hours. If additional hours are required, the chef will be charged at $155 per hour.